You may have seen me mention The Boost Box Company on my social media a few months back. They offer gifts for cancer patients and anyone who may be undergoing surgery or facing an illness. It's a wonderful concept because it can often be a struggle thinking of practical presents when people are facing side affects from illness and treatments. Nadia, the founder is very kind, I previously chose to write about her company over social media because it speaks for itself and product reviews didn't feel necessary. Recently Nadia contacted me again after reading about my surgery and wanted to send me a box under no obligation to review, just as a thank you and to wish me a speedy recovery. I accepted because that first week of recovery was rough. I had no other experience for comparison so I was in the dark how hard it would hit me. 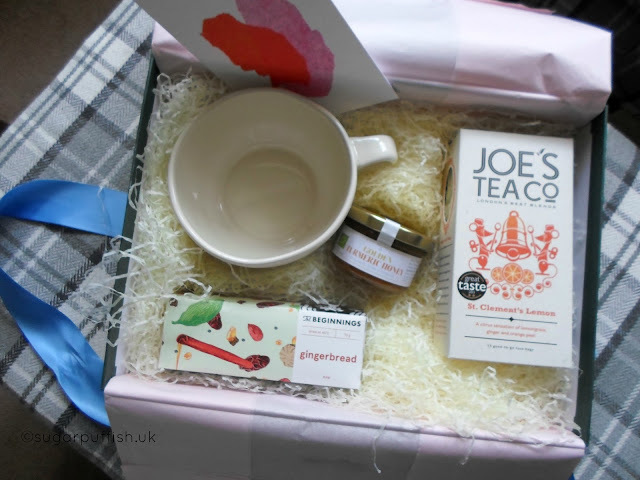 I received the Cup & Tea box which was beautifully presented in a sturdy gift box wrapped with a blue ribbon. Inside there was a soup mug (good size for soups or tea) golden turmeric honey, herbal tea from Joe's Tea Company and The Beginnings gingerbread. As someone who rarely drinks herbal teas I've drank a bucket load of mint green tea during recovery as I became super bored of water and squash. The huge mug is really great because from my experience getting up and down for drinks isn't easy so I always pick my biggest glass or mug. Turmeric and honey are healing ingredients so I appreciate the thought behind its inclusion in the box. I think I counted 20 box options on the site so something to suit most people and situations. Now I've been through recovery I can fully appreciate the service offered by The Boost Box Company and I recommend you visit their website.